If you look for kitchen cart as the solution to organize your kitchen, Winsome Mali kitchen cart is one of the kitchen cart products that is deserved to be considered as your choice. This Winsome product which has home office in Woodinville, Washington has been manufactured for over thirty years. This product is not only make you comfortable and easy to move the cart, but also able to store many things since it provides the cabinet as the storage. Mali kitchen cart which is not difficult to assemble also provides the manual instruction in the form of pictures to describe the steps. In the diagram of instruction to assemble this cart, there are some letter codes that indicate the parts with drawing guide under each piece of letter code. However, it will be very wise of you if you consider the cart option for your kitchen that fits your necessity before you decide to buy it. This product which is strong and durable is made from solid wood. It is available in espresso color with the natural wood applied at the top part. The impressive look owns by Mali kitchen cart is a great choice to add into your kitchen. The attractive natural design of Winsome kitchen cart will be matched for any design of your kitchen or room in your house. It will be a great help for you, especially when you need to move several things from one room to another since this product is easy to mobilize. Besides being made from composite wood, Winsome Mali kitchen cart has three open shelves, one cabinet, and one drawer in large size. This cart that is available with removable inner shelf on the cabinet has dimension 36w x 18.5d x 34.61h inches. The cart that offers additional storage has the weight 73 lbs. The table on the top part can be used perfectly for chopping vegetables or meat, while the towel rack on the side can be used to hang the hand towel and the paper towel. Equipped with four wheels at the bottom of each leg makes this kitchen cart rolls easily to be used in your house. Even though the cart is easily glided, but when the caster is locked it will be sturdy and not be going anywhere. 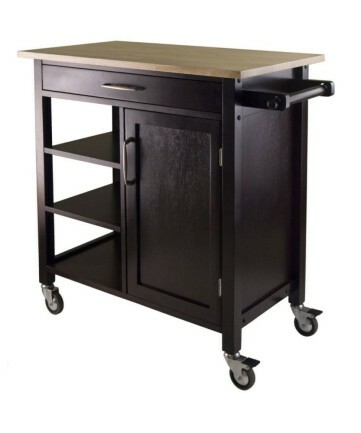 Winsome Mali kitchen cart is available with space of open storage with three shelves that can be adjusted, while in the other side of this kitchen cart has closed cabinet part with removable shelf. This side could be used to frequently keep some cooking spices. You can also use these shelves to store many dishes such as bowls, cups, plates, and many others. Since the cupboard can be stacked and the drawer of this cart has deep long design, it will be able to accommodate many kitchen tools. You can place the skillets and pots in large size in the kitchen cart cupboard. The drawer of Winsome Mali kitchen cart can be used for store the utensils and some silverware as well as to keep the cutting boards and knives.